Just what is ALL YOU magazine you ask? ALL YOU magazine is a magazine targeted at “value-conscious American women,” and I think that probably sums up my readers pretty well (along with a few value-conscious dads too, of course)! Where do I purchase ALL YOU magazine? ALL YOU magazine can only be purchased at Walmart ($2.24 per issue) or through a subscription ($21.24 per year). However, readers have commented in the past that if you can find someone selling it as part of a fundraiser you can subscribe for as little as $20 for two years! The best deal I’ve found lately is going through Live Search to receive a 25% rebate when you purchase it from Magazines.com, making it only $14.99 a year. Update: Now you can get ALL YOU right here on Deal Seeking Mom for just $13.70 for a 1-year subscription!!! Are you an ALL YOU Reality Checker? ALL YOU is looking for for readers just like you to weigh in on a variety of topics. Just register to be an ALL YOU Reality Checker! They just sent me a cool, new mascara a couple of weeks ago to test and give feedback! Rumor has it that the Elevenmoms will be meeting with the editor of ALL YOU next week while we’re in Bentonville! If you have any feedback that you’d like me to share, leave me a comment or send me an email. The coupons are manufacturer coupons, so they’re good at all stores! I just wanted one suscription of All YOU, Tara. I’m pretty new to ordering on line and had some difficulty with the part about the shipping. 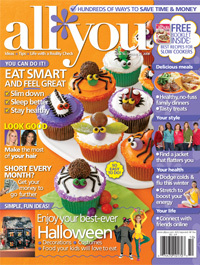 You can request to preview 2 issues of All You magazine for free at http://www.allyou.com. If you decide the magazine is not for you, just write CANCEL on the bill. I never prepay for a magazine subscription. I request to be billed and pay only AFTER I’ve received the first issue and, decided the magazine is something I’d like to continue receiving. That way I don’t end up paying for either a magazine I didn’t receive or one I don’t like. Also if you write CANCEL on the bill and wait, many magazines will send you a special discounted subscription offer in order to get you to change your mind about not subscribing. How do you order the 17.99 for two years deal on the All you mag.? I am clicking on the yelow box but it isn’t working for that price. I’m sorry, Staci. That post had inaccurate information. The best offer I’ve found lately is one year for $13.70. I just got my first mag in the mail this week. It took about 8 weeks for it to arrive so be patient, it’s well worth the wait! Until you start getting them, Walmart sells them. My local library has older copies and I ask if I can use the coupons out of them, which they happily allow me to. Never hurts to ask! Just ordered a 2 yr subscription to the All You Magazine on amazon.com for 34.00 minus a 5.00$ coupon good for today and so I got a 2 yr subscription for 29.00$ which works out to about 14.50$ per year. I really need to check on my subscription I ordered for my daughter, I really wanted to try out your magazine and don’t know if I checked the other free subscription for two. Thank you for letting me know about All You magazine. I subscribed through magazines.com, and entered using bing search which offers a whopping 50% cashback for magazines.com. This means I got the mag for $9.98. On your All-about-All-You-Magazine web page you state in a yellow highlighted box “Update: Now you can get ALL YOU right here on Deal Seeking Mom for just $17.99 for a 2-year subscription!! !” However, clicking on that link takes you to a 1-year subscription offer for $13.70 after discount, not the 2-yr offer described. I also have an e-mail subscription.